Happy Quilting: Starting a new Shortcut!! 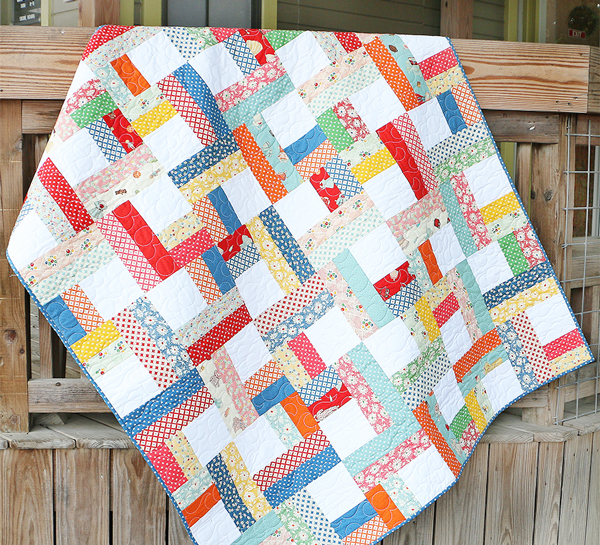 I mean, how fun is this Jelly Roll Twist quilt!!! You can find the free pattern for it over at Fat Quarter Shop along with a video tutorial for making it ;) And hey, it is a shortcut quilt, so it means it whips up fast and then get right back to some long arm quilting (after I add this top to the pile, tee hee hee ;) I plan to add an a few extra blocks to make it just a bit bigger, so it is super snuggly. And so yesterday afternoon I strip pieced all of my jelly roll strips and then pressed them last night. I couldn't help but cut them up first thing this morning and now they are ready to be pieced into blocks this afternoon. Have I mentioned how much I love Shortcut Quilts!!! So fast and fun!!! Oh my stars, I've been dying to use Sandy Gervais' new LOVE fabric!! I can't wait to see your quilt. Okay......I guess I need to make one now too! Hee hee! I love the fabric and the quilt, I will have to put a shortcut quilt on my list right away. Good Morning Melissa! I was so proud of myself for saying "no" when I saw the pattern because like you, I have a pile of quilt tops to be quilted and an even larger number of UFO quilt projects! Yet, seeing the fabulous fabrics you chose and even have cut out...oh how tempting! But, I will just watch your progress! Thank You for sharing!!! Get it done for after christmas! Vanentines day quilt. You sound just like me Melissa! I need to finish something before starting something new. Uh, yeah sure. As if that is ever going to happen! Hahaha!!! Perfect quilt for Valentines Day!! Love your color choices! I have a pile to quilt too...I'm trying to get through it! This going to be fantastic.Beautiful fabrics! I can totally relate to the "getting distracted". I have SO MUCH to finish, yet can't resist starting more!